In my logo design work I mostly enjoy to design fantastic creatures and animals which can be found in coats of arms, popularly called crests. In this article I decided to represent two fantastic creatures in logo design: unicorn and heraldic panther. Although lion and eagle are the most popular animals in logo design, there are some other very interested creatures that you meet not so much, some of them in fact very rarely, because unfortunately the knowledge of their existence is somehow lost in collective memory. One of them is heraldic panther, which can be found in logos, but mostly just as an modernized mark of an county or city traditionally using panthers in their crests. Unicorn is used more often in the logos, but both of these animals are mostly lost their original visual characteristics and attributes still found in classical heraldry. Namely, both of these animals are represented differently from natural horses and panthers. But to see very interesting particulars in their design, one needs to dive in history and the most popular books of the middle Ages according to Bible - medieval bestiaries. Medieval Bestiaries all have their origins in ancient collection of stories named Physiologos, namely, descriptions and didactic stories dealing with animals, fantastic creatures, herbs, even inanimate objects, often with moral content. Those stories are spread across the Europe during middle Ages and they are often mix of Christianity believes, fantastic stories and facts about the natural world which medieval people believed to be true. Panther is represented as a magical creature in bestiaries. It is an animal with very pleasant sweet breath that attracts all other animals to approach to it. All but dragon who hates panther and is always hiding from it. After eating, panther sleeps for three days and when it wakes up it roars and its sweet breath is coming from its mouth so other animals are approaching it again. Panther is symbol of Christ and resurrection in this story, and dragon is obviously a devil who hides from Christ. Sometimes in art, but especially in heraldry, panther isn't similar to natural one. It has a long neck, long ears, a head sometimes reminds on a horse head, and it has a body similar to other heraldic beasts. Heraldic panther in town of Cres coat pf arms and in coats of arms of Hermolais noble family. Drawings by Mladen Stojić, Heraldic art d.o.o., Rijeka, Croatia. Panther is often shown having (colored) spots on its body representing its pleasant smell. Eventually, its breath is started to be represented as fire in some heraldic drawings of the panther. At first, fire was coming out just from its mouth, but later from all wholes of its body. The most famous example is panther in Styrian coat of arms. Panthers in logos today mostly don't have anything similar to panthers from bestiaries and heraldic panthers. They are mostly similar to natural ones and the memory on fantastic beast is somehow lost. I am sorry for that because I am still waiting for a client willing to purchase heraldic panther logo! Heraldic panther as a logo of Hypo Steiermark Bank Source: https://www.webgeek.club/hypo-steiermark-logo.html Designer unknown? Just like panther, unicorn is also a beast from bestiaries, which, like story says, can be caught only by the virgin. 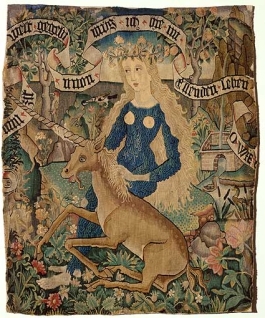 Unicorn is often shown in medieval and Renaissance art posing its head on her lap. Unicorn is also different in its visual representation and most often it doesn't look like a horse. Except the horn, it has thinner body, rich fur and it doesn't have hoof but hoop. Today, in logo design it is very rare to find a real heraldic unicorn. For most clients it is rather acceptable unicorn to be shown as a natural horse - just with a horn on its head. Two unicorn logos designed by Veronika Žuvić. On the left is heraldic unicorn logo. Logo on the right is closer to natural horse, just with horn on its head. I have also seen winged and horned horse logo designs which doesn't make any sence because a creature can be an unicorn or Pegasus,but not something in the middle! With this article I just wanted to remind you of some forgotten symbols that can be shown in logos again, in modern fresh look, but nevertheless founded in heraldry and ever more forgotten sources.